For HF, the station has a Kenwood TS-450S connected to a Barker and Williamson BWD 1.8-30 broadband folded dipole antenna and for VHF an Icom IC-271A is connected to a Sinclair SG201 antenna. For digital modes, a SignaLink USB is used and also a Baofeng BF-F8 VHF handheld transceiver is available for club members to borrow. Currently, the Icom IC-471H is not connected. In 2016, a Yaesu FT-7900 was obtained. All the radios and power supplies use 30 Amp Anderson Powerpoles. 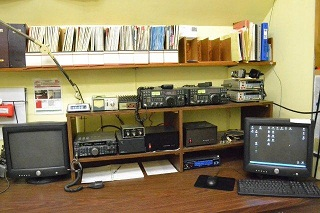 The picture of VE9UNB's shack was provided by Jerry Arsenault, VE9CD. This page was created on October 11, 2012 by Brent Petersen. This page was updated on August 11, 2016 by Brent Petersen. © Copyright 2012-2016, Brent Petersen.